Uttar Pradesh Combined Pre-Medical Entrance Test (UP CPMT) had conducted on new date 25th May 2015 for getting admission in Medical Courses i.e. MBBS, BDS, BAMS, BUMS courses in Government and other approved Medical/ Dental/ Homeopathic/ Ayurvedic/ Unani colleges. 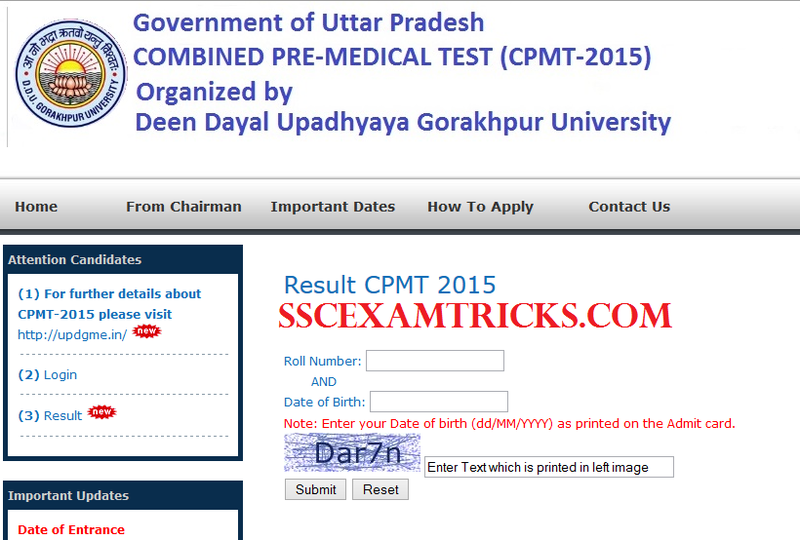 This is the Latest News that UP CPMT 2015 (Medical Entrance Exam 2015) result has declared on 08th June 2015 (As per information brochure, it was scheduled to be declared on 15th June 2015) on official website www.upcpmt2015.co.in. A huge numbers of candidates had appeared in this medical entrance exam 2015. These candidates are waiting for their CPMT 2015 Result online on official website. These candidates can download their result from the direct link provided below. Admission of the candidates will be made on the basis of merit List which will be prepared on the basis of Performance in this medical entrance exam 2015. CPMT 2015 was conducted on revised date (new date) 25th May 2015 rather than 24th May 2015 (as mentioned in Information broacher). CPMT 2015 was conducted by Pen MODE by the candidates. CPMT 2015 was containing 200 questions of 200 marks from Physics, Chemistry, Biology, and Zoology subjects. CPMT exam 2015 was a multiple choice question (MCQ) paper containing four options as answer out of which candidates were required to choose one correct answer. CPMT 2015 had total time duration 3 hours or 180 minutes to complete this medical entrance exam 2015. To download UPCPMT 2015 Result Scorecard Marks Details, candidates need to click on the direct link mentioned above or Official Website www.upcpmt2015.co.in. Then Candidate must enter Registration ID and Date of Birth same as it was mentioned in the application form. In the end click on Submit Button to download CPMT 2015 Result Scorecard Marks Detail PDF File. The CPMT 2015 Result will be displayed on the screen. Save and print CPMT 2015 Result Scorecard Merit List (Hard Copy) for the purpose to display at the time of getting admission in Medical Colleges.